A new iPhone (s AAPL) is expected to debut in the next six weeks or so. And Apple’s supply chain is kicking into high gear to churn out a glut of the shiny new smartphones in order to meet what is likely to be voracious demand. But even when the upgraded iPhone arrives, it appears Apple will continue to build the iPhone 4 in pretty large numbers, according to Rodman & Renshaw analyst Ashok Kumar. From a supply chain perspective, total iPhone volumes could be up high single digits sequentially to around 22 million units with the upgraded iPhone representing almost quarter of the volume. The “new” iPhone is expected to be a spec upgrade and not a complete redesign. It is likely that the existing iPhone 4 could be repositioned as a “lower” cost device and will continue to ship until the rollout of the completely redesigned iPhone sometime next year. Apple has sold “last year’s” model at a discounted price previously — most recently with the iPhone 3GS after the iPhone 4 arrived — so that’s not necessarily new. But this report does jibe with several previous reports that say Apple is planning a “cheaper” iPhone 4, with just 8 GB of memory instead of the 16 and 32 GB versions that it’s been selling since June 2010. It makes sense Apple would continue to sell as many iPhone 4s as it can. The company has racked up sales of the iPhone 4 pretty much unabated, selling 20.3 million devices in the most recent quarter, despite not having a new model iPhone in the summer. Almost fifteen months after the iPhone 4 arrived, Kumar notes, it is still the best-selling phone for AT&T (s T) and Verizon (s VZW). I think the headline of this article is (unintentionally) misleading, because it gives impression that Kumar is talking about Q4 2011, when he must be talking about Q3, 2011. Another possible reason for the mistake is Apple’s fiscal reporting year which is not in sync with the calendar quarters. Apple’s fiscal Q3 is calendar Q4, Apple’s Q1 is calendar Q4 an so on. Looking at past iPhone sales, it makes absolutely no sense that Apple will sell only 5 million of the new flagship device, when it is selling for 3 full months. People won’t suddenly start opting for a second class iPhone, when iPhone 5 comes out and iPhone 4 gets relegated to second class citizenship. 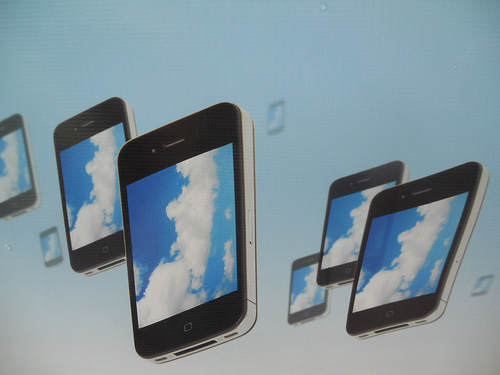 Looking at previous launch hypes, Apple will sell 5 million iPhone 5s in the first 2-3 weeks. That “high single digits sequential growth” and 22 million total number also does not make any sense if we are talking about Q4 2011. Apple sold 20.3 million iPhones in Q2 (April-June) quarter. So it implies that Q3 will have no iPhone growth at all. But if we are talking about Q3 2011 (July-September), the prediction makes a lot of sense. Forecast of high single digits growth to 22 million. New iPhone launch during the last 2 weeks of September with initial iPhone 5 launch sales surge we’ve seen previous years. Suggest you look at Ashok Kumar’s Apple prediction track record. He’s right about 10% of the time. His serial inaccuracy, however, does not slow him down from making outrageous predictions. It appears from this post that the market for iPhone is almost reaching a saturation point. It would be interesting to see how it compares to overall smartphone market growth. Sure if you consider having 5% of the total mobile handset market as saturation. The best analysts believe iPhone has plenty of market share to conquer. Isn’t that just 1 million more than last quarter? So they are going to sell just as many but 80% of them will be for a lower price? That would negatively impact their profits.